I have seen many articles on how to play Angry Birds game in Linux using Wine and other similar tools, but as you are about to see now, there is an even easier method to play Angry Birds in Ubuntu and other flavors of Linux. It is called Chrome Web Store. 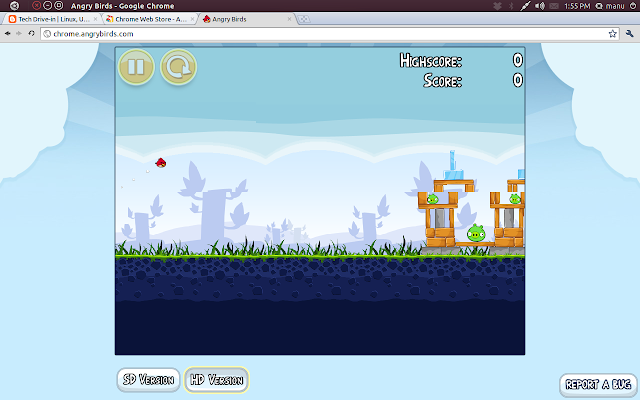 Yes, Angry Birds is now available in Chrome Web Store for free installation. Along with hundreds of incredible applications available, Chrome Web Store now has the widely popular and addictive Angry Birds available for free installation. All you need is a Google Chrome/Chromium web browser and you are done. Download Angry Birds from Google Chrome Web Store. That's my Google Chrome running Angry Birds in Ubuntu 11.04 Natty Narwhal. Hope you all had a good time playing Anrgy Birds in Ubuntu. On a similar note, you might also want to check out our collection of top games for 'non-gamers' in Ubuntu.